Is OnePlus working on a third handset for release this year? Does one plus one equal three? OnePlus has already confirmed it is working on the OnePlus 2 ready for a release by the end of the year, with rumours suggesting it'll be coming in Q3, but a new report has suggested it has two handsets to come by the end of the year. A video report from Bloomberg has a presenter stating, "The successor, the OnePlus 2, is expected in the third quarter and another phone, a cheaper model, is due for release by the end of the year." The video has some clout considering it's during a tour of the OnePlus offices and contains interviews with senior executives including CEO Peter Chou. There is always the chance the presenter has gotten a little muddled up though so we've reached out for comment from OnePlus, but there was no update at the time of publishing. Making this report even stranger, recent rumours suggested OnePlus was aiming to delay the release of the OnePlus 2 as the original handset was still proving popular. Those who already own the OnePlus One are currently getting the update to CyanogenMod 12, which comes with some lovely Lollipop goodness. 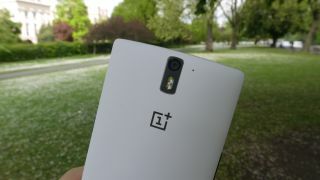 Here's our review of the OnePlus One.